One of the local County libraries where a lot of my ancestors lived has made newspaper archives available on-line with a library card. Previously, I had done some searching on GenealogyBank.com and thought I had found all I was going to find since the same newspaper was available there. But I realized that (I guess) the indexing and OCR process was different because I found very different information. I found an article about my great-great grandmother falling through a sky light in the family fruit and candy store. She was not badly injured but as was the habit of the day, the article pointed out that although many others had walked on that skylight, it probably gave way due to her weight. Another interesting series of articles also involved a woman who had the same name as my g-g grandmother. Apparently this other woman and her friend committed slander against a neighbor by stating that her children knew nothing of their father. Sounds pretty petty by today’s standards but in 1887 it was a big enough deal that several follow up articles had a clarification that the Rose Pisani in he article WAS NOT the wife of Massimo Pisani ( my g-g grandfather). I knew that my maternal grandfather and several of his brothers drove streetcars and then later buses in Baltimore City. The youngest of the brothers had joked to me once that he also drove a bus briefly but after only a few months, several accidents convinced him that he should probably find another profession. He joined the army. I was able to verify that he was involved in several accidents but I also found that none of my transit driving ancestors apparently were very good drivers as they also were involved in several accidents. In fact, my grandfather ran over someone with a streetcar one night on a dark part of the tracks, but it was later determined that the man had already gotten killed by being run over by another streetcar before my grandfather hit him. Going back even further to the 1850s, my 4th great grandfather spent much of his time cleaning up the chaos caused by his 3rd wife. He finally divorced, but not before a long line of people and businesses demanded repayment for goods and services that had been stolen by his wife. On a positive side, I found articles written about my great grandfather and his brothers helping to save people and property during the Great Fire in 1904. All 3 of them were teenagers at the time. I have been happily engrossed in searching the papers for stories of my ancestors, it sure beats going to the library and having to know what dates you wanted to search on microfilm. Also, lesson learned, there may be the same resources on different sites but the way those resources are indexed and OCR’ed could be different, resulting on very different findings. All of us that do genealogy research have those “huh?” moments. In my case, a lot of my “huh?” moments are related to locations and why I find people where I find them or how our paths have crossed in random places generations later. Most of my direct ancestors were born or immigrated to, married, died and were buried within 5 bordering cities/counties in Maryland and Pennsylvania. Sounds like my research would be a piece of cake then doesn’t it? Pffft! Anyway…I can usually take a pretty good guess where to find people when I’m looking for them, but a few have popped up in some unusual places. Unusual because they are places that I did not expect. One day a few years ago I was meeting a friend for dinner who lived in an area that I had never encountered any family connections. I arrived way early and next door to where we were meeting was a public library. So I decided to “waste” the extra time in library. Of course I headed straight to the local history section and just started browsing through some cemetery transcription books they had. I wasn’t looking for anyone in particular, and wasn’t expecting to find anyone in my family, like I said, no connection to this area. But, still I looked in the index for my main research surnames. I came across a listing for ‘Henry’. OK, granted Henry isn’t as common as Smith but, there are Henrys out there that aren’t related to me, although I have Henrys on both sides of my tree that I have not connected. I turned to the page and found “Florence Henry Penn, w/o Francis S Penn”. Wait, what? It can’t be MY Florence Henry and Francis Penn. Why would they be buried in a cemetery here? I looked at the dates and found they were the same. Oh course at this point I wanted to ditch my friend, I was losing daylight. If I hurried I could get to the cemetery with a sliver of light left! I took a breath, came to my senses, the cemetery wasn’t going anywhere, I could visit the next day. I did, it was them and I found out that had I researched them earlier, although Uncle Francis wasn’t born and didn’t live in this town, his family has a strong connection to this area. So I learned to never pass up an opportunity to poke around in a “random” location, you may just be surprised. Author Aunt Barb's PapersPosted on June 6, 2013 Categories UncategorizedTags UncategorizedLeave a comment on What Are You Doing Here? Let me introduce you to Massimo Hazeltine Pisani. Massimo is my 2nd great grandfather in my maternal line. Massimo and I have a love/hate relationship…he loves to hide from me and I HATE it! The picture below was taken at the Pisani house in Govans, Baltimore City, Maryland (year unknown). The location of the house was close to the intersection of York Road and Winston Avenue. 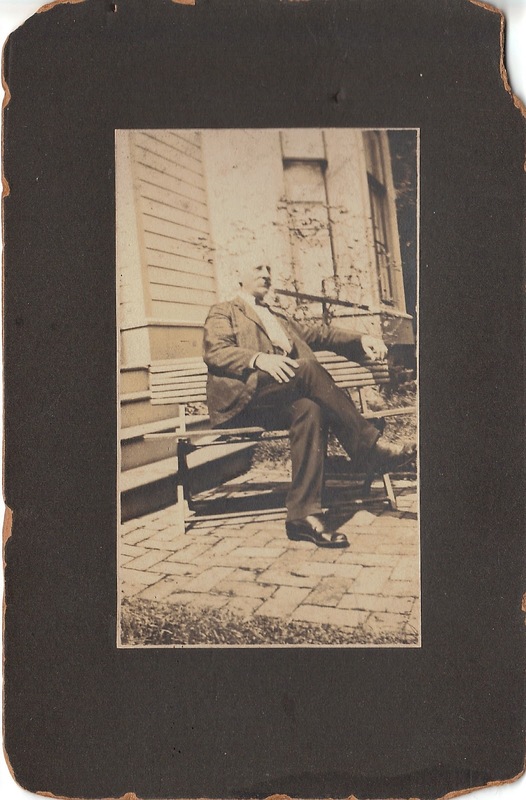 Original photo in possession of Barbara L Henry. Massimo was born in 1847 in Tuscany, Italy and immigrated to the United States in about 1858. He was a fruit dealer in Baltimore City, Maryland until the early 1900s. He married a German immigrant (Rosa Margarethe Epple) in Baltimore City, Maryland in 1871 and they had 5 children. I believe that he had at least one brother, Egisto Pisani b. abt 1843. Egisto served in the Civil War. He may have also had a brother named Antonio b. abt 1830. If anyone has any Pisani ancestors that lived in Baltimore in the 1800s-1900s (there were not many), please let me know. Maybe we can piece this family together. Author Aunt Barb's PapersPosted on May 13, 2013 April 2, 2017 Categories UncategorizedTags UncategorizedLeave a comment on Who was Massimo? I think when anyone starts researching their family history they have hopes of being related to someone famous. As of yet I have found no famous or historically important ancestors in my tree. I’m fine with that. Famous or not, I have ancestors that have come to this country to start a new life, helped establish churches, helped form communities, and defended our country, all important contributions. My direct line is made up of mostly working class folk, including more than a handful of farmers. I also have several blacksmiths (who later became wheelwrights), bakers, fruit dealers and candy makers (oh, those Pisani caramels). Whether or not I ever stumble upon a famous ancestor, I am still proud that I come from a line of (mostly) hard working people just trying to make a living. For me, starting a genealogy blog is a little like starting genealogy research. I have lots of different ideas for my posts, just like I had lots of ancestors that I wanted to find out about. So as not to make the same mistake I made with my research, let me take a deep breath, not get ahead of myself and introduce you to “Aunt Barb’s Papers”, and well, Aunt Barb. When my niece Courtney was younger and I just started researching, I couldn’t seem to be around any of my family without showing off a print out of something I found, a census record, a death certificate or a newspaper article. She started making comments such as “here comes Aunt Barb and her papers”. Well, not so long after, Aunt Barb’s papers helped Courtney with a school assignment (although I supplied her with far more information than was needed for her assignment). So who is Aunt Barb? Although I have been doing research on my family for 10 calendar years, I still consider myself a beginning amateur genealogist. I am a casual researcher, putting in about 10 hours a month. I have about 9,000 individuals in my tree but many without reliable sources because when I started I wasn’t very good at recording where I got my information. So now I’m trying to go back and correct my rookie mistakes. So, I hope that you will enjoy following along with me on my journey. Author Aunt Barb's PapersPosted on May 3, 2013 Categories UncategorizedTags Uncategorized2 Comments on Where to Start?